King is the title given to a male monarch in a variety of contexts. The female equivalent is queen regnant (while the title of queen on its own usually refers to the consort of a king). In the context of classical antiquity, king may translate Latin rex or either Greek archon or basileus. In classical European feudalism, the title of king as the ruler of a kingdom is understood as the highest rank in the feudal order, potentially subject, at least nominally, only to an emperor (harking back to the client kings of the Roman Empire). In a modern context, the title may refer to the ruler of one of a number of modern monarchies (either absolute or constitutional). 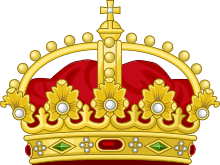 The title of king is used alongside other titles for monarchs, in the West prince, emperor, archduke, duke or grand duke, in the Middle East sultan or emir; etc. English queen translates Latin regina; it is from Old English cwen "queen, noble woman, wife" from the PIE word for "woman" (*gwen-). The Germanic term for "wife" appears to have been specialized to "wife of a king"; in Old Norse, the cognate kvan still mostly refers to a wife generally. Scandinavian drottning, dronning is a feminine derivation from *druhtinaz "lord". The Early Middle Ages begin with a fragmentation of the former Western Roman Empire into "barbarian kingdoms". In Western Europe, the kingdom of the Franks developed into the Carolingian Empire by the 8th century, and the kingdoms of Anglo-Saxon England were unified into the kingdom of England by the 10th century. With the breakup of the Carolingian Empire in the 9th century, the system of feudalism places kings at the head of a pyramid of relationships between liege lords and vassals, dependent on the regional rule of barons, and the intermediate positions of counts (or earls) and dukes. The core of European feudal manorialism in the High Middle Ages were the territories of the kingdom of France, the Holy Roman Empire (centered on the nominal kingdoms of Germany and Italy) and the kingdoms of England and Scotland. Currently (as of 2016), fifteen kings and two queens regnant are recognized as the heads of state of sovereign states (i.e. English king or queen is used as official translation of the respective native titles held by the monarchs). Most of these are heads of state of constitutional monarchies; kings ruling over absolute monarchies are the King of Saudi Arabia, the King of Bahrain and the King of Swaziland. 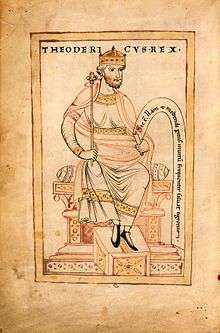 ↑ The notion of a king being below an emperor in the feudal order, just as a duke is the rank below the king, is more theoretical than historical: the only kingdom within the Holy Roman Empire was the Kingdom of Bohemia; the Austrian Empire technically contained the kingdom of Hungary, but the emperor and the king were the same person. The modern Russian Empire and German Empire did not include any kingdoms; only the short-lived First French Empire (1804–1814/5) did include a number of client kingdoms under Napoleon I, such as the Kingdom of Italy or the Kingdom of Westphalia. ↑ The distinction of the title of "king" from "sultan" or "emir" in oriental monarchies is largely stylistics; the Sultanate of Oman, the State of Qatar, the State of Kuwait and the United Arab Emirates are also categorised as absolute monarchies.